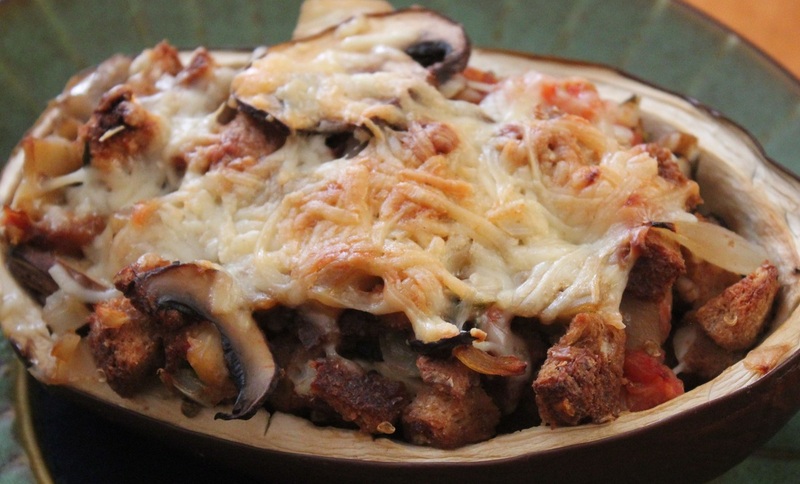 If you are looking for an easy, healthy eggplant recipe this is definitely the one to try. Cut eggplant in half lengthwise. Using a paring knife cut around the edge of the cut side of the eggplant leaving 1⁄4 -1/2-inch around the outside. Using a spoon scoop out the inside of the eggplant and cut the flesh into cubes. Place empty eggplant shells in oven-proof baking dish. Heat oil a large skillet over medium heat. Add onion, garlic and eggplant cubes to oil. Cook about 5 minutes. Stir in mushrooms, tomatoes, bread cubes, parsley, marjoram and salt to eggplant. Cover, cook vegetables 10-12 minutes. Arrange vegetables inside eggplant shells, top with Parmesan-Reggiano and cook uncovered about 40 minutes.